The photos in this post were taken at our old city house. For those of you that sent condolences on the loss of my sewing machine, I thank you from the bottom of my heart. There wasn’t much of a service, just me saying, “Oh crap!” over the corpse. But I moved on to a new love. My new sewing machine is a Brother NX 250. The thing I like most, you ask, well, thanks for asking, I’ll tell you. It’s the easy threading of the machine. Swish the thread through and push down a button, and viola, the machine is threaded. Now let me just say, there is nothing wrong with my vision, and I’m not getting old, it’s just that they make the needles so small these days. And don’t send me emails saying the needles are the same size as before, because I’m just going to delete them. So I recently painted my breakfast rm, click here and kitchen. That meant that the old skirt I had in my buffet no longer went with the new paint. Here’s the before below. I’ve painted the cabinets and will show you the cabinets in another post. Here’s the new curtain. I used a canvas fabric and added one of those adorable Target feed sack kitchen towels to the front of the curtain. I was having so much fun with my new sewing machine, that I used one of the decorative stitches to the top of the feedsack towel. This was one of those fun sewing projects that takes a hour or so that I love. I have 42 YARDS of linen sitting in my office waiting for me to start my living room slip covers (gulp, gulp). These are going to take me probably about a month, when you factor in meals, sleep, and all of that stuff my family expects me to do. I mean really, I think doing your own laundry builds character, and who among us couldn’t benefit from skipping a few meals? When I explained this to them, they tilted their heads like a dog that’s trying to pick up some distance sound it can’t quite make out. I considered using my daughter’s tactic and running to my room, all the while yelling that they don’t understand me, then throwing myself into a dramatic heap on the bed, but I didn’t want to get my new bed spread all wrinkled. I mean really, I think doing your own laundry builds character, and who among us couldn’t benefit from skipping a few meals? When I explained this to them, they tilted their heads like a dog that’s trying to pick up some distance sound it can’t quite make out. I considered using my daughter’s tactic and running to my room, all the while yelling that they don’t understand me, then throwing myself into a dramatic heap on the bed, but I didn’t want to get my new bed spread all wrinkled. This CRACKED ME UP!!!!!!!!!!!!!! Thank you for the big laugh, I needed one. I love the new skirt, with the decorative stitch. Can’t wait to see the whole cabinet. I know it will look awesome! XO, pinky PS, have a GREAT weekend, Anita. c’mon. I can’t believe you’re holding out on us, and then another “come on” cause you hadn’t shown me those black tole trays!!! Anita, Anita… it’s going to be fabulous I know! 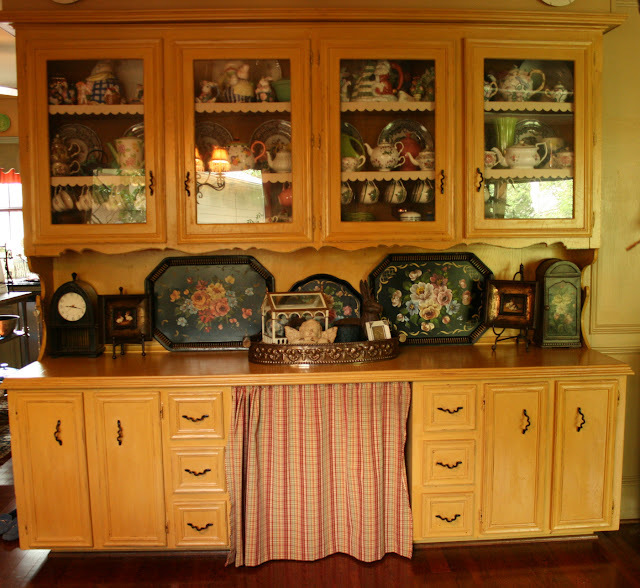 Anita that looks amazing and I love the little peek we got of your painted cabinets! Can’t wait to see the full reveal! Oh, and the end of your post made me chuckle because it’s sounds just like my house LOL! LOVE all of your changes!This is looks great!I would love to do that in my kitchen.But I am not sure I can with my cat.I think she would take up residence under the sink LOL! WheW!!! I only have ONE in my household that is dramatical when I tell him, “I need some ME time..could you do dinner?” Oh, well!!! Be brave and continue on, dear friend! By the way…I L O V E D this post!!! Anita, that looks so good. Cute idea using the towel. Haha! I think you should do it just to see the look on their faces! Are you seriously going to have those slipcovers done in one month? One short month?! You are putting us procrastinators to shame I’ll have you know! Love the new skirt and the stitch looks like a fleur de lis design. Your sink skirt is pretty and I can’t wait to see your cabinets. Love your new look Anita! The cabinet looks amazing! And your new sewing machine sounds divine. Anything to make the threading easier gets 2 thumbs up in my book. That always takes the longest for me. Wow sounds like you have alot of sewing ahead..good thing u have a new machine. I may have to check that out if it threads your needles! I’m waiting for Christmas. Here in Spain, we receive presents the 6th of January when the three wizards kings arrive from Orient. This year, I’m going to ask them a sewing machine, if I am a good girl perhaps …. I was quite moved by the words you said over your old sewing machine! You are quite correct about the needles, they are definitely much smaller, and why has print been made smaller too? Love the new curtain, and I look forward to seeing more of the cabinets. LOL! I loved this post! I agree. Sewing machine needles are getting smaller and smaller. I keep a magnifying glass by my machine to see what size needle I’m using! And I’m right there with you about wanting to mimic your daughter. But I’m not worried about the bedspread. I don’t want to mess up all my pillows! I love quick sewing projects! Your curtain is delightful! Anita, welcome to your new acquisition. My machine died years ago, and I’ve yet to replace it. Need to! I LOVE the skirt!! I have that same towel from Target, but I never would’ve thought to use it like that! This cabinet transformation is amazing! And that curtain…I just love it! I haven’t seen the Target feed sack towels. I would not have known that’s what that was. It’s so very cool.